You can count on our lengthy experience in masonry works to realize your desired outdoor features. Our company started doing masonry-related works for residential and commercial properties in Peoria, Phoenix, Scottsdale, and surrounding areas. We initially offered landscape curbing but eventually decided to try our hands on creating exquisite outdoor features using pavers, bricks, and other premium materials. To date, we have built hundreds of stunning garden steps, patios, driveways, and other landscape amenities worthy for a postcard. So if you want to be sure that you’ll get absolutely eye-catching masonry pieces, then call us today. Why Choose Us for Your Masonry Needs? Certified masons. Our masons are all duly certified by industry organizations. This makes them capable and ready to handle your masonry concerns no matter how complex they may be. Highly experienced. Aside from industry certifications, our masons are also highly experienced since they have worked on dozens of similar projects in the past. They know which techniques to adopt for a specific piece and what materials to use to achieve the effects that clients demand. Formal training. Our crews were trained by some of the industry’s brightest minds. Our masons are likewise constantly sent to seminars and training to keep them updated on the trends that the best masons observe. Dedicated. You won’t find other masons in Peoria or any other AZ cities that we serve with equal dedication as our crews. Our personnel work hard and only have your satisfaction in mind. Work efficiently. We are known for our systematic design and installation system, which allows us to proceed with each step smoothly. We follow streamlined steps and always manage to complete projects on time and even ahead of schedules. One way by which we ensure smooth workflow and excellent results is by using appropriate and modern masonry tools and equipment. These tools allow us to handle small to large projects, whether in residential or commercial properties, with guaranteed positive results. 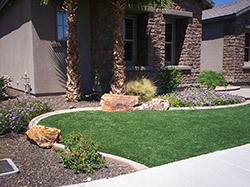 At Advant-Edge Decorative Curbing & Landscaping, we only get masonry materials from leading suppliers. One of them is Belgard, which is incidentally among the world’s most renowned manufacturers of hardscaping materials. This means that the pavers and blocks that we use are of premium quality and guaranteed to result in features of absolute beauty and durability. We also use premium supplies and products from other equally reputable manufacturers and brands, so you’re guaranteed that your desired amenities are built from world-class materials. 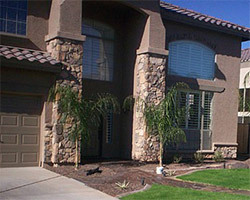 If you want to know more about our offered services for Peoria, AZ residents, just call (623) 398-6319. We’ll be happy to discuss your masonry needs.